Perennial forage crops are the foundation of ruminant livestock feeding programs in the North Central USA. Unfortunately, because of the harshness of the region’s climate, perennial forage crops, and particularly alfalfa, occasionally winterkill, leaving the producer faced with an immediate loss in supply of high quality forage. This is a reality we may face this winter (2002-2003) as many alfalfa fields in Minnesota were water-saturated going into winter, and we’ve had essentially no snow cover combined with some very cold temperatures thus far. Concerns about autotoxicity limit the producer’s ability to replant alfalfa in winterkilled alfalfa fields. And even if the producer risks attempting to re-seed alfalfa after alfalfa, seeding year productivity always falls far short of an established stand’s productivity. In other years, excess spring moisture does not allow producers to seed perennial forages during the window of time that typically ensures the greatest likelihood of establishment success. The producer is thus faced with a forage supply shortage and will generally need to plant an annual forage crop to fill the gap. July. 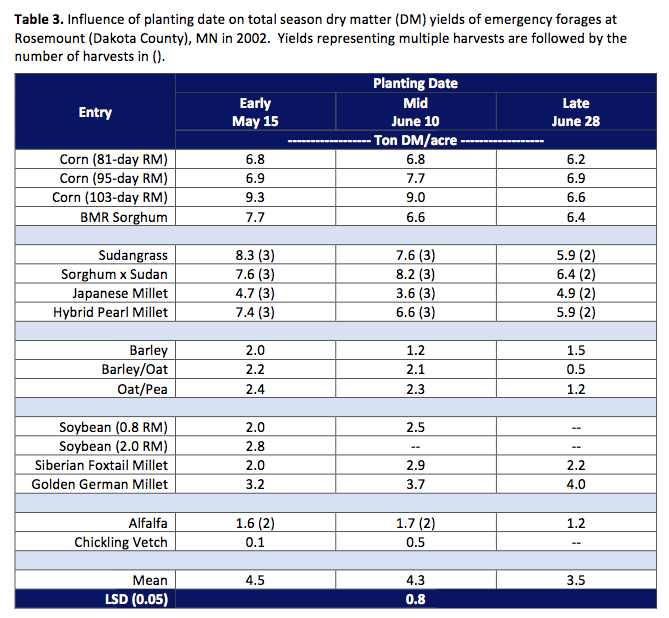 While some information exists on yield and feeding value of various annual crop alternatives, there is no comprehensive comparative information, particularly at the late planting dates. Proper selection and management of the emergency forage can be a key to the farm’s short- and long-term profitability and sustainability. In 2002, we conducted an emergency forage trial at two locations in Minnesota: one on a dairy farm near Pelican Rapids, MN (Ottertail County, west central MN), and the other at the University of Minnesota’s UMore Park in Rosemount, MN (Dakota County, near the Twin Cities). The Ottertail County farm location was used to represent northern Minnesota, and the Dakota County research station represents southern Minnesota. Alfalfa plus 16 different annual crops with forage potential were seeded in replicated plots at each location in spring/summer 2002, and they will be planted again in 2003. The trial will also be planted in Wisconsin and Michigan in 2003. The crop species are listed in Tables 1 and 2. Replicated plots were seeded at both locations. Three planting dates were evaluated. 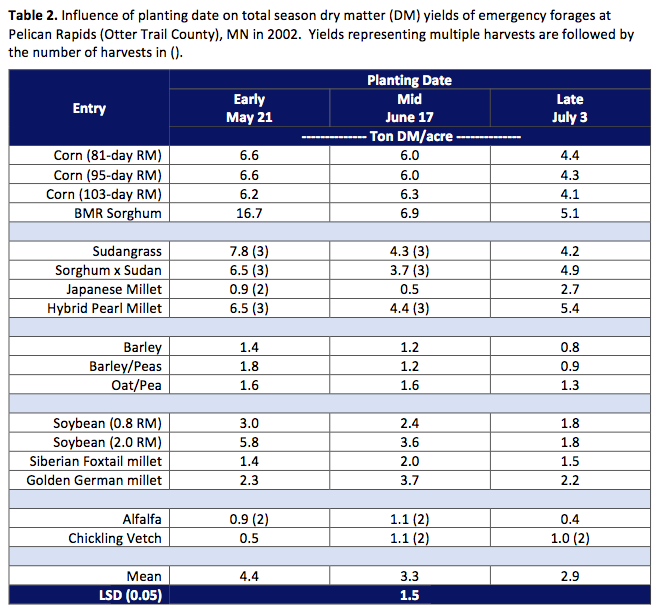 The early, mid, and late seeding dates at Rosemount were May 15, June 10, and June 28, respectively. Corresponding planting dates at Pelican Rapids were May 21, June 17, and July 3. Corn and brown midrib (BMR) forage sorghum plots were seeded 1-1.5 inches deep in four 30” rows with a single row planter at Pelican Rapids and with a 4-row corn planter at Rosemount. All other entries were seeded in ten 6” rows to a 1⁄4 to 1” depth depending on seed size. Plots including legumes were inoculated with the proper Rhizobium species. Fertility was not limiting at either location. Dairy manure was incorporated prior to planting at Pelican Rapids so soil test P and K levels were very high. P and K levels at Rosemount were high. All warm-season grasses (corn, BMR sorghum, sudan, millets) received 75 lb N/ac within 10 days after planting, and those grass entries with multiple harvests received an additional 50 lb N/ac after each cutting (except the final cutting). Thus, entries with 3 harvests received 175 lb N/ac during the season. All corn and forage sorghum plots were harvested by cutting the center two rows of each four- row plot to a 6” stubble. The remaining entries were harvested with a flail harvester at Rosemount, and with a sickle harvester at Pelican Rapids. Stubble height for sudangrass, sorghum x sudan, pearl millet, and Japanese millet was 6” to encourage regrowth, with the last harvest at 3”. All other entries were cut to a 3” stubble. In general, harvest timing was scheduled to optimize yield and quality. The exception was the final harvest of multi-cut warm-season grasses, which were allowed to mature until temperatures were too cool for continued growth in September. Thus, mid-season harvests of these entries were at vegetative stages, but their final harvest was often at a reproductive (heading) stage. Based on previous research on regrowth potential after harvesting, sudangrass, sorghum x sudan, hybrid pearl millet, and Japanese millet were scheduled for multiple harvests; and the foxtail millets were scheduled for just one harvest at boot stage. Yield data were collected at each harvest. Feeding value will be determined on samples of harvested material by drying and grinding the material and analyzing for several parameters in the University of Minnesota Forage Quality laboratory. Feeding value (forage quality) parameters will include crude protein, neutral detergent fiber (NDF), NDF-bound crude protein, ether extract, ash, and NDF digestibility. For some of the forage species, starch content will also be measured. The MILK2000 spreadsheet will be used to estimate potential milk production per ton and per acre and to estimate the energy content of each forage. An economic evaluation of the forage options for use by dairy and beef farms based on yield, production cost, and feeding value parameters will be performed. Table 1 summarizes precipitation and temperatures at the research sites. After a cool, dry May at both locations, the remaining growing season (June-Sept.) was very warm and wet. From June through September, temperatures averaged 3.0°F above long-term averages at both locations. During the same period, rainfall was over 10” above long-term averages at Rosemount, and almost 8” above long-term averages during just July and August at Fergus Falls. Total season yield results are reported in Table 2 (Pelican Rapids) and Table 3 (Rosemount). Feeding quality data are not available yet. We caution that these are only one-year yield results; two years of data will be needed before conclusions/definitive recommendations can be made. Yields of warm-season species were unusually high at both locations, probably due to the combined effects of above average temperature and rainfall. Entries did not always produce less at later planting dates. For example, at Rosemount, yields of the 81 and 95 RM corn entries planted June 28 did not differ from yields for earlier planting dates. However, the longer-season 103 RM corn and BMR sorghum did produce greater yields when planted earlier. In contrast, at Pelican Rapids, late (July 3) planting resulted in reduced yields of all four of these entries. Nevertheless, within a location, these entries produced similar yields when planted late. Total season yields of multi-cut warm-season grasses were competitive with corn and BMR sorghum at all planting dates. The exception was the June 17 seeding at Pelican Rapids, and Japanese millet at all planting dates and both locations. Japanese millet may produce higher yields under a one- cut system. The one-cut foxtail (Siberian and Golden German) millets produced less forage than the other warm-season forages, but they produced this yield in significantly fewer days. They tended to perform best at the middle seeding date in mid-June. The 3.7 tons DM/ac produced by Golden German foxtail millet planted in mid-June was achieved within about 60 days. In addition, the foxtail millets established well at all planting dates and locations. Barley and small grain/pea mixtures produced considerably less forage than the warm-season grasses, and had difficulty with weed competition at later planting dates. Soybeans struggled with deer damage and weed competition at Rosemount, but performed surprisingly well at Pelican Rapids where deer damage was less and weed control more effective. The later-maturing soybean produced more forage than the earlier maturing soybean only for the early (mid May) planting date. At Pelican Rapids, the 5.8 tons forage DM/ac produced by the later maturing soybean planted in mid-May was greater than total season yields of most established alfalfa stands, and based on previous work with soybean, forage quality may be similar. Thus, full-season soybean may have potential as an alfalfa forage replacement in emergency situations. Alfalfa generally produced considerably less forage than all warm-season species at all planting dates, indicating the potential emergency forage value of the warm-season species. Stands of chickling vetch were generally poor, which may reflect inappropriate seeding depth. Plants that did established appear to compensate for the thin stands, but their regrowth after harvest was generally poor. Data presented in this report are preliminary – only one year results – so decisions regarding emergency forage crop selection should not be made based on these data alone. The 2002 growing season was ideal for maximum production of warm-season annual species, thus performance of these entries in 2002 is probably not representative of production potential during more “normal” growing seasons. With two years of data we will be able to make stronger recommendations. Acknowledgements: The authors wish to recognize and thank 1) the Minnesota Department of Agriculture for partial funding this project via their Sustainable Agriculture Demonstration Grant program; 2) David and Julian Sjostrom for their tremendous cooperation in providing the Ottertail County field site and site preparation; 3) Dr. Dan Undersander, University of Wisconsin Forage Agronomist, for assisting with the development and design of these experiments; and 4) Agassiz Seed, CROPLAN Genetics, Mycogen Seeds, and Olds Seed Solutions for providing seed for the trials.